Dataprobe’s iPIO offers web managed inputs and outputs that are both Telnet and SNMP manageable. The iPIO brings network management to real world events via remote response to physical events. The live camera shows one “local” iPIO-8 with four inputs, and two remote sites each with an iPIO-2 device. 2) Start the Demo Click on the Start Demo button below to start a 90 second sequence of alarm closures. Each input change to the local unit will be sent to one of the iPIO-2 units at the bottom of the screen. The automated input changes to the “local” unit are transmitted to the remote sites and can be monitored by the iPIO-8 web interface in real time. You can also explore all the setup and control features on the iPIO-8 web interface. iPIO is simple to install and easy to use, but enables you to develop highly flexible telemetry systems. We can also work with you to tailor custom and OEM applications for your specific needs. 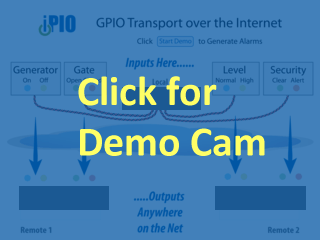 iPIO gives you the ability to transport digital I/O across Ethernet networks with IP protocols. Multiple iPIO devices can communicate amongst themselves to transport I/O information across your network, and links are bidirectional, so events in either location are reflected at any other site. Any changes in status appear at the other end of the network as relay outputs. 2 Units are required for End-to-End transport. See Discount on Paired Units. Get real time status updates on you web browser and click to control any relay. Monitor and control digital I/O worldwide using an SNMP V2 compliant manager. iPIO also sends email when events occur. One click relay control from clear web browser interface. Set name, qualifying time and color scheme for each relay. Send contact closure information across the network to one or multiple places. Get the information you need, where you need it. Manage with SNMP or create your own custom programming to operate relays over the network. Continuously monitors data link between each device and alerts you when the network fails. Receive updates on all input and /or output activity. SNMP V2c compliant MIB. Integrate into you network management scheme. Configurable for +VDC inputs 3-30 volts. Get status information from one point to multiple locations simultaneously. Ideal for load-shedding and security alert notifications. Summarize multiple alarm points to one location. Two Inputs and Two Outputs. Ships with 120/240VAC power supply. Can also be Power over Ethernet (PoE) as well. 8 Inputs and 8 Outputs. Ships with 120/240VAC power supply. 16 Inputs and 16 Outputs. Ships with 120/240VAC Power Supply. The iPIO Mounting Kit is everything you need to attach iPIO-8 and iPIO-16 to a DIN rail or wall/backboard. Model iPIO-2 includes DIN clips and does not use this kit. Two High Current Relay Set for add-on to any iPIO. iPIO Relays support 0.5A @ 120VAC or 1A @ 24VDC. If larger current capacity is required, add the ELK-912-2 relay board to support 7A @ 30VDC 10A @125VAC. Eight Input Terminal Blocks and Eight Output Terminal Blocks. Order two to replace all terminal blocks for iPIO-16. Two Input Terminal Blocks and two Output Terminal Blocks. (fits any iPIO-x Model for two circuits). Model PS-WRI-6. 100-240VAC Input, 5VDC Output. Includes NEMA Linecord (Call for Others). This main screen provides real-time updates of all inputs and outputs. Click on any relay to change. Control names of the input as well as open and closed names, and status colors for text and background. Configure each remote for status transmission and immediate action. Height 1.74" Width 5.63" Depth 3.03"
Height 1.25" Width 5.00" Depth 7.50"
Height 2.00" Width 5.00" Depth 7.50"
Network Link (Link) and Activity (Act). Remote Unit Link Status (Rmt). Selectable Port assignments for Web, and DxP Protocol.